Naantali, Finland – It’s been nearly a year since the twins discovered–and fell in love with–the Moomins. It’s been about nine months since we had to persuade them to be something else for Halloween. And it’s been about six months since we have been planning our trip to Moomin World. Basically, as soon as I got the Moscow gig we started plotting our return to Finland so we could go see the Moomins (and do follow-up research on our book, of course, sure, that’s the main reason we are here). Well, today was the day. In anticipation of the occasion, the twins both came down with nasty colds (recurring theme). This morning, they woke up at ungodly hours. We had to plop them in front of the TV to make it through the morning. Daddio and I did our part by forgetting to put the stroller in the car. We were not off to a good start. But none of that was important when we walked across the bridge and set foot on the island that is home to Moomin World, a magical place where the twins’ TV friends came to life and invited them on adventures. 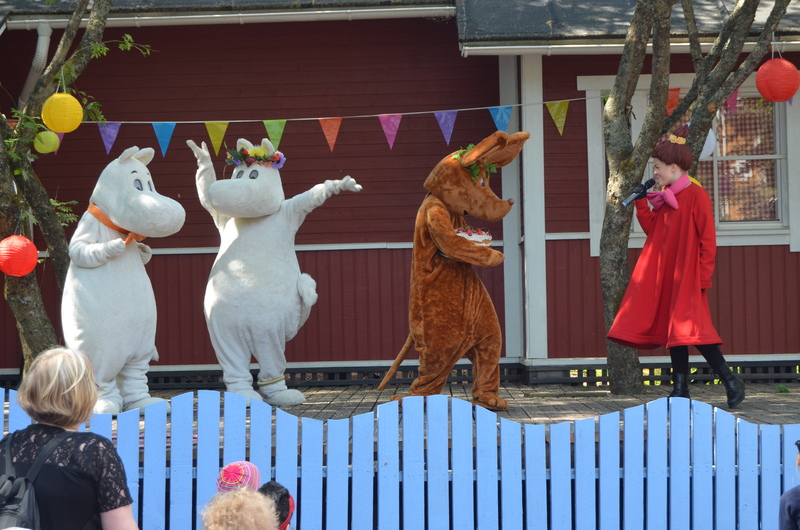 I enjoyed Moomin World much more than I expected. I had been skeptical, as it’s not exactly an amusement park. There are no rides or games to speak of. Sure, there are costumed characters, and a few shows in the theater. But it was not clear to me what kids actually do there. Now I understand. What the kids do there is so much better than rides or games. First and foremost, they meet and interact with the Moomins and their friends. I was really impressed how the characters really engage the kids. Within moments of our arrival at Moomin House, bossy Little My had brought out bubbles for everyone to play with. The loveable vagabond Snuffkin invited the kids into his tent for story time. 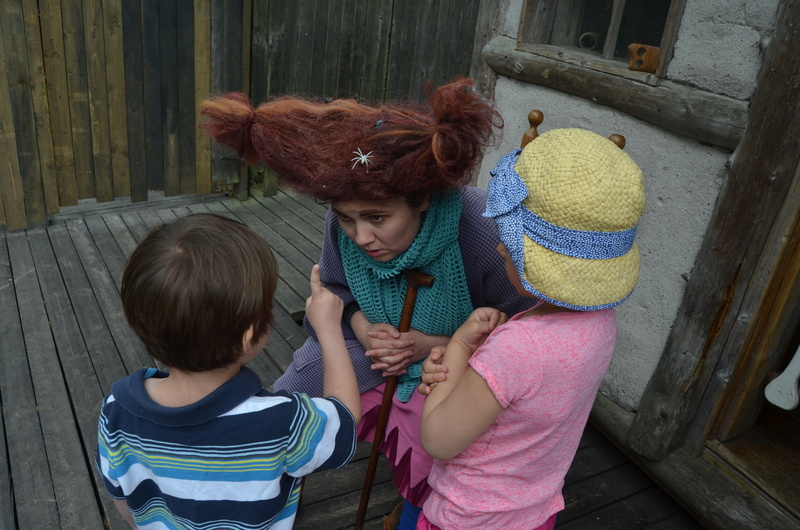 All of the characters spend hours giving hugs and talking to the children and answering their questions. Second, the kids get to explore the places where the Moomins live and work and play. They get to test out Moomin Papa’s typewriter and cook in Moomin Mama’s kitchen. They get to venture into the Forest of Witches and help the Witch make frog soup. They can climb Lonely Mountain and–if they keep their eyes open–they can find the King’s Ruby (which the Hobgoblin has been searching for for 500 years). These are just life-size re-creations of the TV-show and book settings, without any animation or fancy technology. It’s nothing more than a giant play island where kids can re-create the Moomins’ adventures and make their own new ones. What I really loved about Moomin World was how it forced the twins to suspend their disbelief. Prior to our visit, the Moomins had been cartoon characters on TV, but today they met them in person. Surely, they were real. 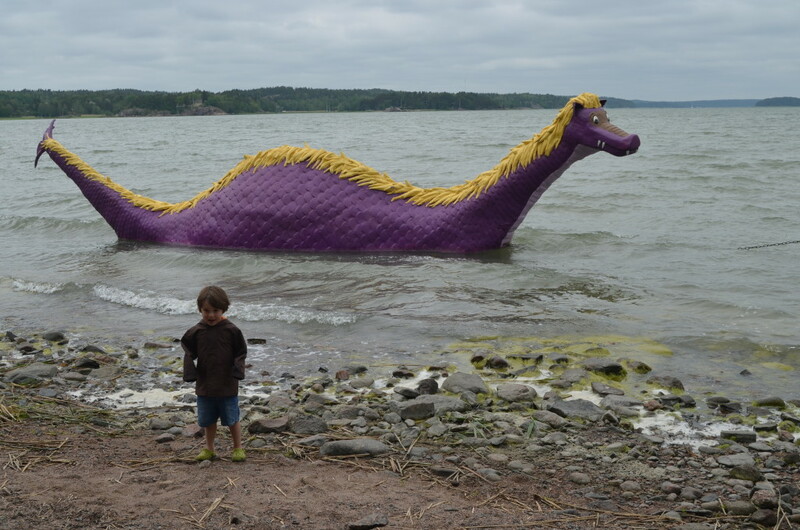 They saw the sea serpent bobbing in the waves. Was it real? At first, I was not sure how to answer these questions. Of course I don’t want them to go through their lives believing in Moomins and monsters–or do I? The greater danger, perhaps, is that they will go through their life with an overly rigid definition of fantasy and reality. This is especially dangerous if it is created by someone else. So I started answering the twins’ questions in ambiguous ways, demonstrating the same wonder that they were clearly feeling. I don’t know if it’s real, what do you think? Twin V did. And Snuffkin came up with a very satisfactory answer. The Groke is a sort of ice monster, so it stands to reason that she does not really come out during the warm summer months, but prefers to stay in the cool comfort of her cave. And with that, Twin V knew that his greatest fear and biggest hope would not be realized: there was no chance of seeing the Groke glide about Moomin World, freezing everything in her path. At least not today.